Year 1 and 2 children had a taster of a session with a Professional tennis coach, Tee, from Thornhill Tennis Club. Children and staff really enjoyed having a go at a sport that some had never experienced before. Mr Williams organised a fantastic football tournament at Headfield where Thornhill Lees played Pentlands and Saviletown infants. Thirteen children from the football club went along to represent our school and they certainly did us proud. Their behaviour both on and off the pitch was exemplary and it was lovely to see them supporting each other as well as putting their skills into action. A big thank you to Mr Williams for all your efforts! Reception enjoyed a full day of training from 2 instructors with the balance bikes and the teachers saw their coordination really improve. Year 2 children have really enjoyed cricket coaching with Joe this half term. Their hand-eye coordination has really improved and Joe was particularly impressed with their team work. Some very lucky children enjoyed a morning at Saviletown Infants with friends from Pentlands and Saviletown Infants. They developed their hand-eye coordination and target practice with some fun activities delivered by Miss Farhana. Look at the concentration on their faces! What a great club Joe is running for us at the moment. The children are loving it, as you can see from their faces! In Journey to the Blue Planet our space themed PE unit, children from 1AL loved working together to make their own rocket ship. Children love Real PE in Year 1. This is Pirate Pranks where children practise balancing on different parts of their body and working with a partner. Ms Logan has continued to offer this brilliant club every Thursday lunchtime. Lots of children attend and have a good stretch before their afternoon lessons. Joe worked with children from YR to Y2 to improve their dodgeball skills. All the children absolutely loved it. It was a boiling hot afternoon when Key Stage 1 had their Sports Day. Despite the weather children completed all their races and then enjoyed ice pops and juice to cool down. 2 year olds, Nursery and Year R all had their fun on Monday 9th July and thankfully the weather was not as hot. Mr Williams was very proud of our first-ever football team at Thornhill Lees. They had been training hard all year and their commitment and hard work certainly paid off in their match against Pentlands which they won 3:1. Well done everybody and thank you Mr Williams for your dedication when coaching the children. On two very hot afternoons in June Year 1 children welcomed Year 1 children from Pentlands and Saviletown schools for their annual Multi -skills festival. Children enjoyed 7 fun activities run by some very grown up ex-Thornhill pupils who are now Young Sports Leaders at Headfield School. All children took part in a fun event and walked 1 mile for the Around the World Challenge for the Forget-me-Not children's hospice. Our events took place over a week and each year group walked 5 times around our school grounds. They collected a flag for their hats after each lap and enjoyed a piece of fruit from that country. Everyone had a great time and together the whole school managed to raise a brilliant £600 for this very worthy cause. All year groups have enjoyed special dance lessons this term with a professional dance coach. Amy worked on the topics of mini beasts with Year 2, fairy tales with Year 1 and is currently working on nursery rhymes with Reception. Each year group has thoroughly enjoyed their learning and produced some excellent work in a short time. It was on a cold April morning when some lucky Y2 children travelled by minibus to Hanging Heaton Cricket Club. There they practised batting and bowling techniques with 3 other schools. Mrs Hardcastle and Mrs Rafiq accompanied the children and said that everyone thoroughly enjoyed themselves and that as the children progressed through the activities, a real improvement was evident. Well done everyone and thank you for representing our school so well. We enjoyed our Sports Relief day and raised £148 for the charity. It all began with a 'wake up shake up' in the hall followed by a carousel of sporting activities. The day ended with a demonstration by some very talented teachers of a complicated country dance. Here are some photos of the day. One afternoon in February, James Martin, a professional cricket coach, came in to teach our Y2 children. He explained the All Stars Cricket Program to the children and they had great fun learning some of the techniques which it teaches. James was very complimentary about the behaviour of our children and spotted some rising stars amongst them. Thank you Y2s, you did Thornhill Lees proud! We had great fun keeping fit with Georgina and made a fantastic dance. We had great fun in our PE lessons in Year 1. Our theme was Journey to the Blue Planet. Can you see our wonderful rockets? The children had lots of fun using the balance bikes! They were able to tell the difference between a balance bike and a standard bike. The children worked on their balance skills and steering. Lots of fun was had by all! Several very lucky children from KS1 went to Saviletown for a fun morning of sports. They improved their hand-eye coordination in a variety of throwing and catching activities. This was followed by circle time and refreshments. New friends were made and lots of fun was had!! Year 1 loved working on 'Thembi walks the Tightrope' learning how to execute a static balance. 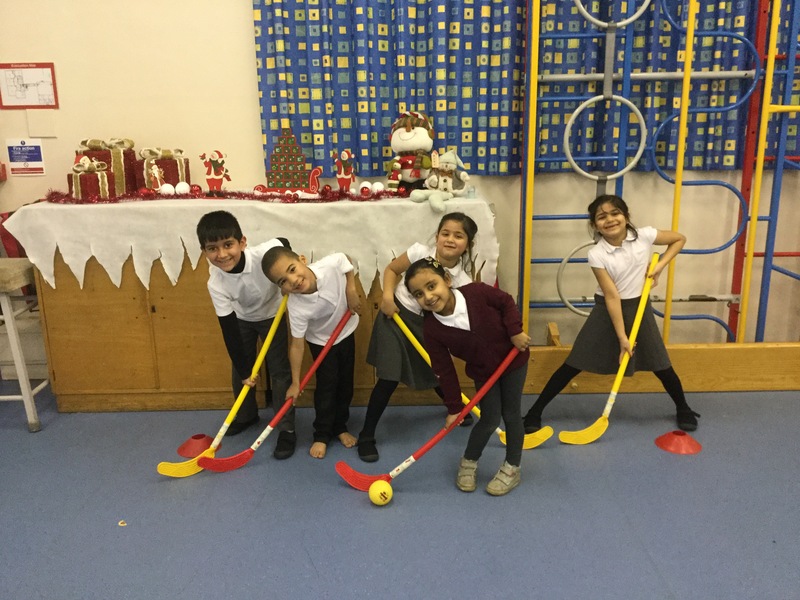 Children from Year R and Year 1 had great fun learning new skills and playing competitive games of hockey on Monday nights after school. Just look how professional they look with their hockey sticks. Sports Coach Joe ran a lunchtime athletics club which was very popular. Children really enjoyed learning how to improve their running and hurdling techniques.. Thanks Joe. On Tuesday 28th April Key Stage 1 children competed against each other in their termly Multi-skills competition. It was a hard-fought contest but Team 5 eventually triumphed scoring 232 points. Moreover all teams improved on their December scores. Nursery children joined in and undertook sporting activities as did 2 year olds. Reception are eagerly awaiting their Multi-skills day which will be happening soon. The children in nursery really enjoyed practising their Multi skills. Each key group took it in turns to complete the different tasks, with the hope of improving on their time. I'm glad to say that all groups did improve on their time and in their abilities.